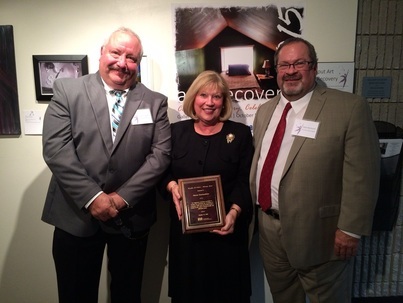 Sharon Deschambeau, center, accepts the 2015 Geraldine B. Nelson Advocacy Award from Tri-County Board Chairman Dennis Butts (left) and Executive Director Mark McDaniel (right) during the Art of Recovery Showcase October 21 at Edison Community College in Piqua. For 2015, we recognize an individual who can only be described as a mover and a shaker. She has taken the lead in bringing to the table decision-makers from across the spectrum - business leaders, community leaders, elected officials, courts, healthcare, behavioral healthcare and others – to create a coalition to address the serious challenge of opiates and specifically heroin’s effects on Greenville and Darke County. Without this strength of will, without this vision that through coordinated efforts conditions can change, we would not be where we are in addressing this very complex problem. It is in recognition of this achievement that the Tri-County Board of Recovery and Mental Health Services recognizes this year’s winner of the Geraldine B. Nelson Advocacy Award, for supportive measures on behalf of another, by promoting the recognition of consumer rights and encouraging positive change in the realm of mental health and addictions issues, presented this day, October 21, 2015, to Sharon Deschambeau.